For over thirty years, a small fleet of airplanes made possible each space shuttle flight. First, there's the Northrop T-38 Talon. 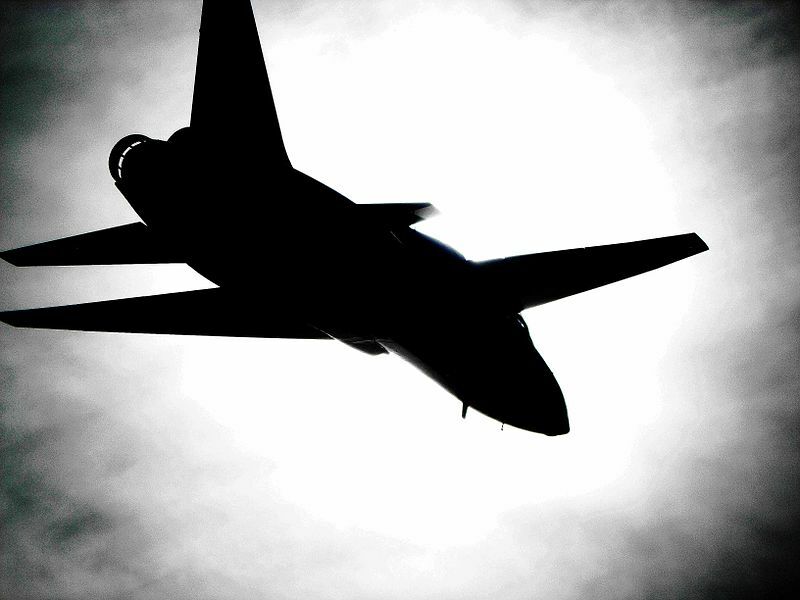 The T-38 is the world's first supersonic jet trainer, and the longest serving, as T-38s are still in use today. During the heyday of the space shuttle program, NASA operated a fleet of over 30 of these little airplanes, which were used to train astronauts and employed as chase planes during the first space shuttle landings and space shuttle transport flights. 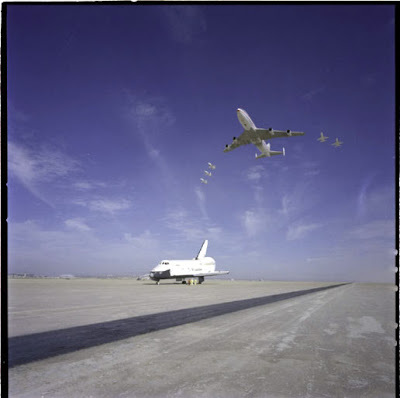 Five T-38s fly in formation over the Space Shuttle Enterprise, in 1977. Astronauts have relied on T-38 jets for transportation between Cape Canaveral, Houston, and a myriad of other training destinations. Access to these jets also kept military pilot astronauts' flying skills sharp. But in the early days of manned space flight, T-38 crashes killed a stunningly high fraction of NASA's astronauts. Of the first 30 astronauts hired by NASA in the late 1950s and 1960s, four died in T-38 crashes: Theodore Freeman, Elliot See, Charlie Bassett, and C.C. Williams. The high fraction of T-38 fatalities likely says more about the amount of time the astronauts were spending flying T-38s (a whole lot of time) than any other contributing factor. 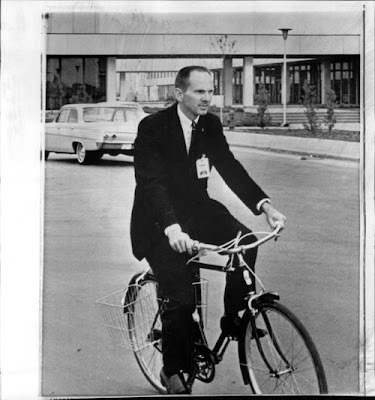 Astronaut Theodore Freeman, biking to work at Mission Control in Houston. Despite that grim statistic, many astronauts think the T-38 is a nice plane to fly. It is relatively predictable, with few unusual difficulties. But... only experienced pilots can fly the T-38. According to what I've read, NASA currently only allows astronauts who are military pilots (on active duty, not retired) to fly its T-38s. It's not a forgiving aircraft, especially at slower speeds. It is relatively hard to handle on landing because of its high stall speed. 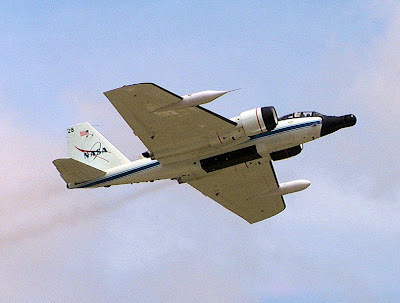 One of NASA's T-38s in flight. In addition to being used for crew training and transport, T-38s were used as chase planes, to observe early space shuttle flights (the first seven shuttle flights or so). 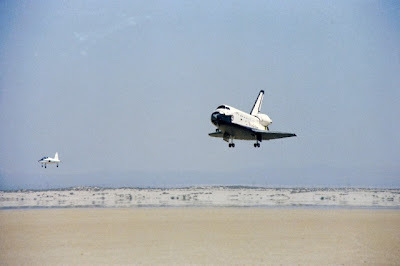 T-38 crews would fly behind the shuttle as it approached the runway, confirming that the spacecraft's landing gear has been extended and gathering data on the craft's performance. 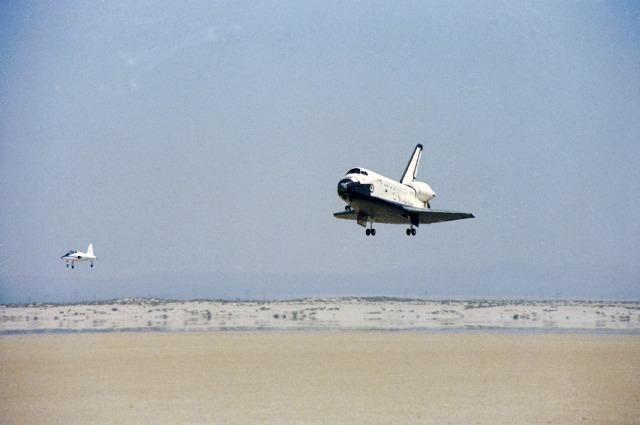 A T-38 chases Columbia on the shuttle's inaugural landing in 1981. As I mentioned, the T-38 is part of a whole fleet of aircraft that supported shuttle missions. 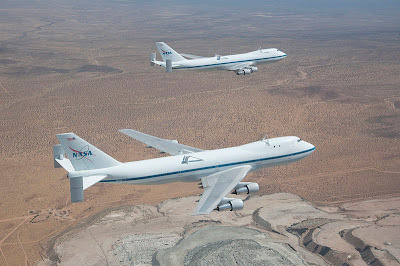 There were two modified Boeing 747s that served as Shuttle Carrier Aircraft (SCA); these are perhaps the most well known NASA planes. The T-38s have worked with them too, for example accompanying the shuttles and SCAs as chase planes on the final shuttle flights last year. 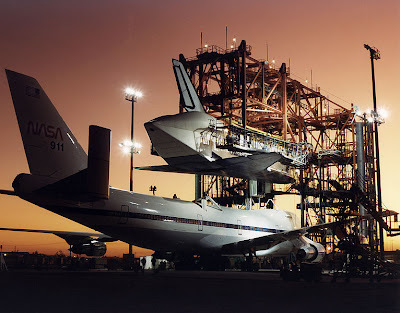 Atlantis, being mated to a shuttle carrier aircraft. 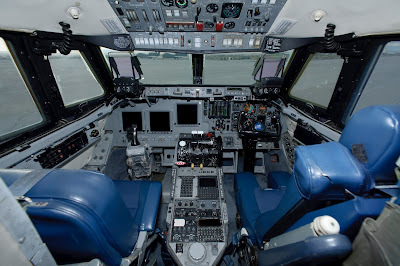 There were four modified Gulfstream II aircraft used to train shuttle pilots with simulated shuttle landings. They were also occasionally used in place of T-38s to transport shuttle crews. I talked in more detail about how that training worked in another blog post. The shuttle controls are on the left; regular Gulfstream II controls are on the right. NASA also operated two Martin WB-57Fs, called NASA 926 and 928. NASA 926 and 928 are unique in that they the only two Martin WB-57Fs still in service anywhere in the world today. These aircraft served as chase planes during each shuttle launch. STS-114, Space Shuttle Discovery, launching. The view from one of NASA's WB-57s. They were modified to carry a special high-definition camera, and could cruise at a high altitude, tracking the launch. Historically, 926 and 928 been used not just to observe shuttle launches, but for other scientific purposes, as they are equipped with a range of sensors and can carry very large payloads. NASA's 928, back in the space shuttle days. As is true for the other aircraft I've discussed, NASA has less use for the 926 and 928 since the shuttles stopped flying. But while NASA may not be using 926 and 928 these days, someone else is. These two planes started showing up at airbases in Afghanistan and elsewhere a few years ago, with new low-profile paint jobs. Presumably, they are in use by another government agency, on a not-space-related, secret mission. A 2012 photo of NASA 928, repainted. It seems a little sad that these two airplanes, the last of their kind, are no longer tasked with observing launching spaceships. NASA 925 was retired in the early 1980s, sits at the Pima County Air Museum in Tuscon, Arizona. One of the four Gulfstream II trainers has also been retired, since 2011 it has sat at the Texas Air & Space Museum in Amarillo. NASA is set to retire half of its T-38 fleet by 2015. NASA's two shuttle carrier aircraft. What's next for NASA 928 and 926, the three remaining Gulfstream IIs, and what's left of the T-38 fleet? Are they all destined for museums, scrapyards, or re-purposing in a few years? Or, as the United States begins launching manned space missions again, will there be a renewed role for these veteran airplanes? Sources: NASA; Arlington Composite Squadron; Collect Space; Astrosaur; Wikipedia; theaviationist.com.